Rank 'Em returns with a countdown in podcast form! 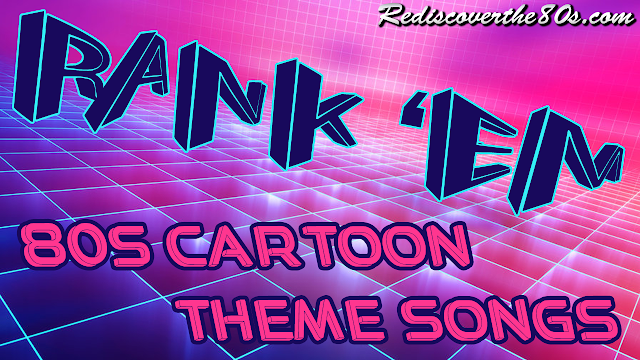 This time we will tackle the entire decade and rank our favorite cartoon theme songs. Thanks to a recent Twitter battle over what themes were best, Jason invites a guest to set the record straight about some personal favorites and why they are worthy of a Top 5 ranking. In case you need a refresher, Rank 'Em features host Jason and a guest who put together a Top 5 list on a specific topic. On the podcast, we will reveal our choices along with a few honorable mentions and give an explanation on the choices. Remember, Rank 'Em lists are always based on our personal favorites and not what "should" be the Top 5 based on popularity. For this episode, Jason welcomes first time guest Brian Cave of OldSchoolEvil.com to reveal our Top 5 cartoon theme songs. Brian's list is also posted on his blog if you care to find out his choices before listening to show. Otherwise, be ready for several intergalactic themes, a couple songs that sound like they came from the '50s, and some of Disney's greatest hits. To reference a couple things mentioned in the podcast, please check out the Cybertronic Spree YouTube channel to see this awesome cover band in action. For G.I. Joe fans, check out the Welcome to Cobra Island Rap Album which contains samples of many tracks from the Real American Hero animated series.